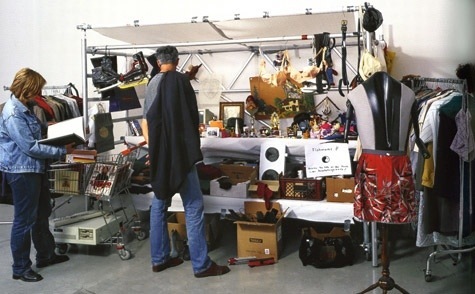 On the eve of Martha Rosler’s Garage Sale at New York’s MOMA, I can’t help a brief question mark about the exhibit as garage sale, or exhibit as sale period. With respect to Ms. Rosler who has been having these out of context garage sales since 1973 at many locations including the Generali Foundation, Vienna (1999); the Museu d’Art Contemporani, Barcelona (1999); Moderna Museet, Stockholm (2004); and The Institute of Contemporary Arts, London (2005), I question the impact of this kind of engagement. So I understand she is questioning the suburban staple of the garage sale by putting it in a museum context. Besides the disruption of the museum goer, and the forced viewing of hand me downs, I’m not sure of the consequence here. I actually think garage sales are a perfectly normal, green and good use of energy when you think of the tides of consumption we are up against these days. I also think they are pretty entertaining as someone’s goods can tell so many stories. I know she has written very eloquently on the matter, and there can be cannons dedicated to the garage sale as social petri dish, so I can see where curators might find this project compelling. At the Walker Art Center there is an artist jewelry mart going on now – less an art exhibit, and more a way to garner interest and sales from museum goers. Though it is an event that is front and center in their exhibitions and events. Why not turn the galleries into studios for artists for a week each – Look!! Artists at work!! Please don’t feed the artists…. Or at SFMOMA last year their was a full blown popup store by artist Stephanie Syjuco called Shadowshop. While not a garage sale, this shop as exhibit carried handmade wares by local Bay Area artists. 100% of the sales profit went directly to the artists making Ms. Syjuco a very popular lady in the Bay Area amongst artists (museum representation AND sales, YAY!). And yes the show opened on December 6 last year, just in time for holiday shopping. It was up through April and I would be curious to learn the net profit. Again, besides creating a hiccup for museum goers and another form of consumption for them, I’m unclear of the consequence of this work. Nice to have artists’ editions all in one spot I suppose. And of course a wonderful opportunity to support artists. Too bad it’s not being sold still online. Lastly, there is a series of store windows being designed at New York’s New Museum Store through January 20, 2013. The tiny window will be designed on a weekly basis by women artists, and the series is called “She’s Crafty“. Um. Last I checked a lot of men shop in New York, and some of the finest window designers of all time have been men (Jasper Johns and Robert Rauschenberg dabbled in window dressing with the combined pseudonym Matson Joneseven back in the day). So why the exclusion of men? Ce qui vient au monde pour ne rien troubler, ne mérite ni égard ni patience. What comes into the world to disturb nothing merits neither attention nor patience.